﻿ PRODEXPO Exhibition – Moscow 7-11 February 2011. PRODEXPO Exhibition – Moscow 7-11 February 2011. Prodexpo 2011 was successfully held at the Moscow Expocentre on February 7-11, 2011. Prodexpo is the largest food forum in Russia and Eastern Europe. In this 18th presentation of the Prodexpo exhibition there were record levels of attendance with over 2000 exhibitors from 55 countries. Prodexpo 2011 was attended by over 51,000 visitors, 95% of whom were food industry specialists. 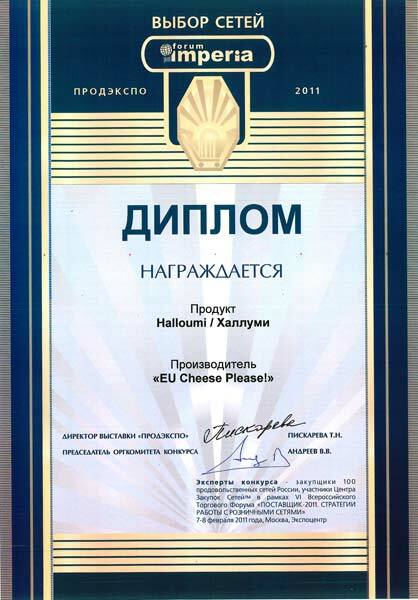 The “EU Cheese Please” participation at the Prodexpo exhibition was the seventh and most dynamic exhibition attendance for the programme so far. The "EU Cheese Please" exhibition stand (85B20) was prominent and situated at the very entrance of the two largest pavilions of the exhibition - "Forum" and “Pavilion 8”. It was well designed and situated on a large island site with enormous printed banners featuring all the cheeses being promoted. The stand featured a centerpiece display which included four connected “seamless” screens that broadcast the programme videos and TV spot. This was interesting for all passers-by and stand visitors who stopped to look at the big screen with the cheeses and the cooking demonstrations. Local stand hostesses, local interpreters and hosts from Cyprus and Bulgaria created a welcoming atmosphere which made the “EU Cheese Please” stand very popular. As is characteristic of the “EU Cheese Please” stand all five European cheeses (Halloumi, Kashkaval, White brine cheese, Anari and Kefalotyri) were offered in platters for tasting by the gracious stand hostesses. Stand visitors and passers-by found it difficult not to taste the delicious Halloumi that the professional culinary chef grilled on site for all to taste! The stand also featured a display of promotional posters, promotional folders, information brochures all of which are given away to stand visitors by the stand hostesses. During the Prodexpo exhibition a special business “matchmaking” session was organised for the proposing organisations and their producer members; between 10-15 traders, supermarket buyers, and interested others participated in order to develop business partnerships. The “matchmaking” session provided an opportunity for attendees to get comprehensive product information; colleagues exchanged experiences information and established business contacts. The Prodexpo exhibition also hosted a tasting competition called the "Choice of chains". Representatives of popular supermarket and retail chains “judged” the products in the tasting competition. Products making an impression on the “judges” often end up on the supermarket shelves! 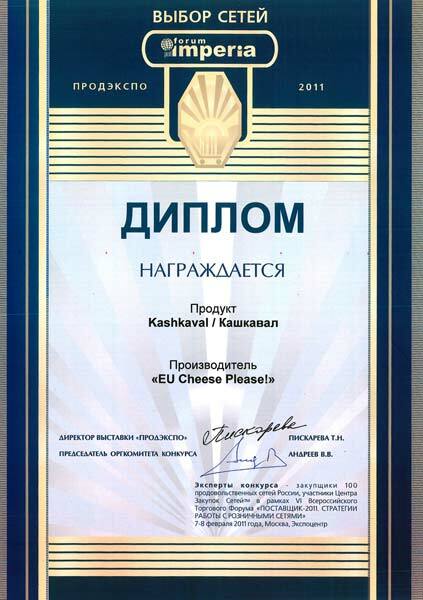 The “EU Cheese Please” organisers submitted all the cheeses to the “choice of chains” competition and were delighted that two of the programme cheeses namely Kashkaval and Halloumi were awarded as “Choice of chain cheeses”. (Please see Awards below). All in all, the Prodexpo 2011 exhibition was another rewarding experience for the “EU Cheese Please” delegation. This was the seventh exhibition attendance for the programme out of a total of eleven approved exhibition attendances. The “EU Cheese Please” team looks forward to attending Prodexpo 2012.